A Norwegian Polar Institute and WWF-Canon scientific expedition is collecting critical data about Europe’s most westerly polar bear population. A Norwegian Polar Institute and WWF-Canon scientific expedition sets off tomorrow to collect critical data about Europe’s most westerly polar bear population. The population on and around the Norwegian Arctic archipelago of Svalbard is facing a future without summer sea ice. A recently published paper suggests the area will be ice-free in summer by 2050. The research team is on the lookout for polar bear denning sites on the islands, where females go to give birth. There is some evidence that the population is moving away from traditional sites, and the movement may well be linked to changes in sea ice. It is not clear where new sites may be, but there is reason to believe they may be on islands further to the east where the ice stays longer. The NPI researchers on the expedition will place satellite collars on bears to enable tracking their routes over the next year or so. Comparing the bears’ positions to satellite information about the sea ice will help explain the bears’ response to ice conditions, and help project likely future adaptations. 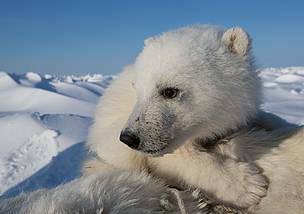 Four of the bears collared this year will be trackable on WWF’s polar bear tracker as soon as the collars are activated, allowing people around the world to follow the bears. The expedition is sponsored by Canon Europe, Conservation Imaging Partner of WWF International. Canon has a longstanding partnership with WWF that goes back over sixteen years, using imaging expertise to help WWF record and promote awareness of the state of the environment and climate change. It is supplying photographic equipment for this project and sponsoring a leading Swedish wildlife photographer and Canon Ambassador, Brutus Östling, to capture images of the wildlife encountered along the way. WWF is one of the world’s largest and most respected independent conservation organizations, with almost five million supporters and a global network active in more than 100 countries. WWF’s mission is to stop the degradation of the earth’s natural environment and to build a future in which humans live in harmony with nature, by conserving the world’s biological diversity, ensuring that the use of renewable natural resources is sustainable, and promoting the reduction of pollution and wasteful consumption.